The Ripple cryptocurrency is a medium for instantly converting every other digital currency. This is done without relying on a central exchange. Ripple blockchain technology applications utilize unique consensus system by preference than being dependent on proof-of-stake or proof-of-work in proving transactions. Its advantages are very clear: it requires little energy in running and processing transactions more quickly than a proof-of-work system. As of Sept. 27, 2017, Ripple cryptocurrency has a market capitalization of around $7,821+B dollars, the third-largest among digital currency. Ripple XRP is a wholly new type of digital money, as in Ripple coin. It is an alternative of exchanging Ripple directly for products and services same way with a traditional currency. It is a medium in converting digital currency into any other cryptocurrency, without a need of a central exchange. For this unique reason, no retailers are directly accepting XRP. On the other hand, Ripple possesses the potential for more trade in several existing digital currencies. Strikingly, Ripple doesn’t care what type of currency you are offering or what type of currency you are seeking. Ripple supports token representations to nearly every single currency including fiat currency, such as yen and dollars. It also supports digital currencies, like Bitcoin or Ethereum, and other currencies similar to air miles and reward points. The name Ripple stand for both a digital currency, XRP and an open payment system. It is an open-source, distributed payments system. The Ripple XRP digital currency empowers real-time payments worldwide. It has performed exceptionally well during 2017. It is the world’s third-largest digital currency in terms of market capitalization. Ripple is classified as a cryptocurrency with the purpose different to Bitcoin or Ethereum. Bitcoin is a payment system while Ethereum is multiple functionality platforms aimed at decentralized SmartContracts. Ripple is a decentralized blockchain technology in banking and other monetary institutions solution that is scalable at 1,000 transactions/second. It is both acting as a digital currency and a digital payment method meant for financial transactions. 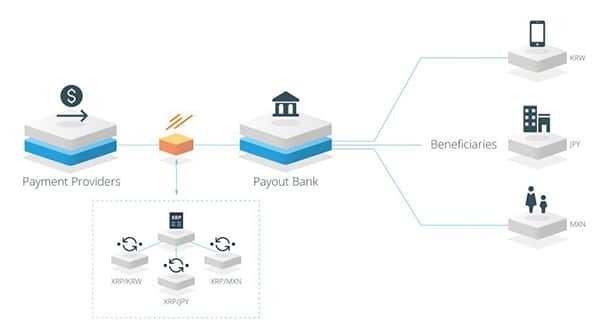 As it is built for enterprise use, Ripple XRP offers a reliable on-demand option in real-time to source liquidity for cross-border payments for payment providers and banks without having to pre-fund Nostro accounts. Because Ripple supports token representations, and since these tokens are basically e-IOUs (electronic IOUs), this requires that all users must trust each other to actually pay the funds they owe. Actually, this is less risky than it sounds. In this scenario, users can openly specify who among the users on the network they must trust and precisely how much of each type of digital currency they should trust them to handle. When a user makes an attempt at a transaction, Ripple thenceforth works to look for a route between the parties where every stage is a link between two people who trust each other. To have non-Ripple currencies get into the Ripple network, users must trust their real-world funds to special users called Ripple Gateways. These are businesses that provide a systematic approach for a currency and other forms of value to move in and out of the ripple network. It can be banks, currency exchanges, money service providers, and any other financial institutions. These Gateways works much like Paypal. You transfer any currency denominations to Paypal, and then Paypal acts as a go-between in allowing you to send your money over the internet. And more importantly, Paypal is far less flexible in terms of what currency denominations you can trade in. A consensus system in the Ripple cryptocurrency is not perfectly reliable. It can compromise by a lag networking system or malicious users. And whenever an unreliable result is reported for which the system is designed for, it will reject result and start again. This will cost minor delays in the service but ultimately will preserve the security of the system. Ripple has now acquired an extensive line of followers. But, because of its design, Ripple will never totally replace analog currencies.